More good vibrations for CD Tenerife as they held second placed Malaga to a 0-0 home draw in an entertaining match. 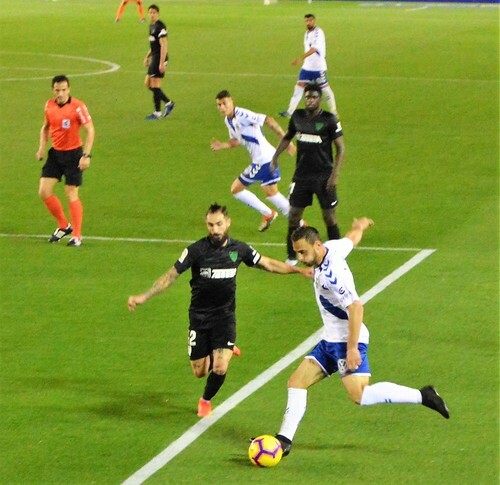 Even with Montañes and Camille out injured, Tenerife continued their revival in form, and only a mix of nerves from new striker Coniglio, and athletic saves from visiting keeper Munir, denied another win. N´Diaye put an early header over the home bar, Malbasic had a similar miss at the other end, and Munir juggled a long shot before clearing the danger. Hector Hernandez was drafted in at left back and set out to show he wants to stay at Tenerife despite the club telling him he should look elsewhere. The previous weeks debut boys Rasic and Borja Lasso kept the home midfield tight and offered plenty of attacking options. N´Diaye was a thorn in Tenerife´s side, he was involved in most of their best moves and was hard tackling on and off the ball. He tried to curl a shot around the diving Dani Hernandez but sent it outside the upright. Suso was hustling as always, he pitched up a deep cross from the right which Munir plucked out of the air. There was a rare Scottish born visitor in the shape of Jack Harper, formerly with Real Madrid and Brighton, he was a throwback to the old British forwards, strong and awkward to mark, but his final ball let him down, noticeably after he turned Hector inside out. 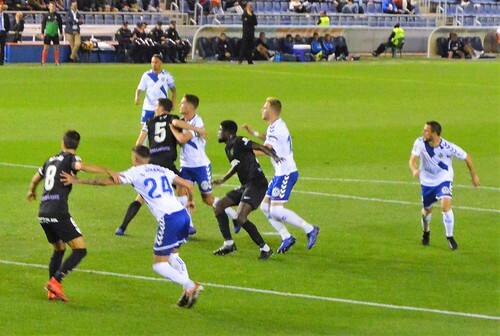 Tenerife were more adventurous in the second half, Naranjo showed a glimpse of a threat, beating the Malaga defence before putting his shot wide. Coniglio arrived to add to his few brief minutes the previous week, he looked more dangerous than Naranjo who went off for him. Malbasic carved an opening but the tall new strikers header was a little weak. Another chance soon followed, this time a half clearance that came to his feet, he scuffed the shot and it went begging. Jorge marked his 100th game as a senior Tenerife player with a polished performance but was unable to crown it with a header that went close. 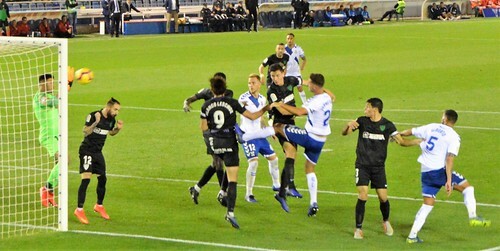 A corner from Luis Milla found Borja whose shot was tipped up by Munir, the keeper tidied it up by diving into a crowd of Tenerife players and claiming the ball. Coniglio had one last near thing as he hit a shot into a defender, Suso calling in space might have been a better option. Hector was having one of his better games, a timely intervention on sub Ontiveros prevented a late break, and Dani denied the same player with an injury time save. The January transfer window still has more possibilities to offer and Tenerife at last have a chance to push up the table.